The Tellus Project in Northern Ireland was successfully completed in 2007 – view our free data. The Geological Survey of Northern Ireland invites tenders for scientific research applications of existing Tellus and NEW! Tellus Border data sets. This tender is part of the Tellus Border project financed by the INTERREG IVA programme of the European Regional Development Fund and is open to EU residents. 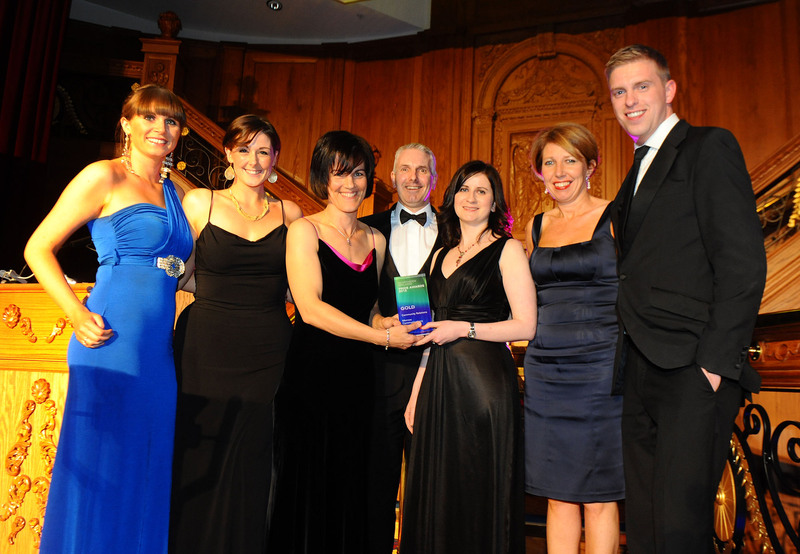 The team behind the EU INTERREG IVA-funded Tellus Border Project, led by Marie Cowan and including Mike Young, Mohammednur Desissa and Claire McGinn from GSNI, has picked up a top industry award for excellence in communications at the CIPR Northern Ireland PRide Awards. Collecting Gold in the Community Relations category, as well as a Silver award in the Public Sector category, the team was recognised for its wide-ranging and innovative communications outreach prior to and during its geological survey of the border region of Ireland, which took place earlier this year. Pictured at the event are Seona McGrath and Kelly McKee, Morrow Communications; Marie Cowan, Project Manager Tellus Border Project, Geological Survey of Northern Ireland; Richard Gaston, Category Sponsor The Lyric Theatre; Mairead Glennon, Assistant Project Manager, Tellus Border Project, Geological Survey of Ireland; Claire Bonner, Morrow Communications and host Marc Mallet of UTV. Geoscience 2012 Conference "From Research to Jobs"
The Geological Survey of Northern Ireland, Geological Survey of Ireland and the Royal Irish Academy are pleased to announce a one day conference “A Safe City; The Contribution of Geoscience in the Urban Environment” to be held in Dublin Castle on the 18th April, 2012. It will be part of a three day event, with the 2nd and 3rd days titled Geoscience 2012 Conference - "From Research to Jobs" 19th, 20th April, 2012. The general themes of the conference are water (both surface and groundwater) and hazards in the urban environment from the perspective of the public sector and industry. as geoscientists reveal the extraordinary formation of our precious rocks, minerals and landscape. Don’t miss this fantastic family event with something for all ages! As part of the Tellus Border project an airborne geophysical survey will be flown over the six northern counties of the Republic of Ireland: Counties Cavan, Donegal, Leitrim, Louth, Monaghan and Sligo. A contract has been awarded to Sander Geophysics of Ottawa, Canada, who will use the same geophysical aircraft and equipment that were used in the Tellus surveys of 2005/6. The operation will start in the summer. Tellus Border is funded by the INTERREG IVA programme of the European Regional Development Fund. Visit the Ireland stand at PDAC Toronto, the world's biggest mining convention! As usual, the stand is mounted jointly by GSNI and the Energy and Mining Division of the Republic's Department of Energy, Communications and Natural Resources. 20 February 2011 Tellus featured prominently at the annual Irish Geological Research Meeting held in Galway, 18-20 February. Mohammednur Desissa and Mark Patton presented the results of a new interpretation of basement geology, based on Tellus aeromagnetics. Mike Young described the new 'Tellus Border' project and, with Alex Donald, showed a poster of the newly developed 3D geological model of Belfast. Joint GSNI/GSI/BGS posters featured the recently launched website of Historical Maps of Ireland and the progress of a crustal scale 3D model of Britain and Ireland. The latest phase of the Tellus campaign, 'Tellus Border' was launched this week in Belfast and Dublin. Tellus Border will extend the Tellus surveys into the six northern counties of the Reublic of Ireland, continue analysis of existing data over Northern Ireland, and incorporate three post-doc research projects into wetlands eco-hydrology, soil carbon and peat, and behaviour of pollution plumes in the near-surface. The project will be managed jointly by a partnership of GSNI, GSI, Queen's University, Belfast and Dundalk Institute of Technology. The cross-border project has been funded by the INTERREG IVA development programme of the European Regional Development Fund, which is managed by the Special European Programmes Body (SEUPB). This is the largest of the latest awards under the Environment theme of INTERREG IVA and is part funded by the Department of the Environment of Northern Ireland and by the Republic of Ireland's Department of Environment, Heritage and Local Government. In Belfast, Ministers Arlene Foster MLA and Edwin Poots MLA gathered at Stormont to launch the project with the Vice Chancellor of Queen's University, Peter Gregson, and GSNI Acting Director Terry Johnson. Project staff and senior management of SEUPB were present. At the same time, at Kildare House in Dublin, the project was launched by Minister Conor Lenihan TD with GSI Acting Director Dr Pat O'Connor, Dr Valerie McCarthy of Dundalk Institute of Technology and project staff. Tellus maps featured in the highly acclaimed Channel 4 programme, 'Birth of Britain' series, in the edition titled 'Gold'. The inimitable Tony Robinson traced the history of gold exploration since the Bronze Age in Britain and Ireland. The film showed Garth Earls, until recently GSNI's Director, taking Robinson prospecting up a stream section near the Curraghinalt gold deposit in County Tyrone. Link: Birth of Britain on the Channel 4 website.